Sugar has one thing going for it: It makes things taste good. And it’s a taste we’re born to prefer. In the natural settings that human primate ancestors evolved in, sweetness intensity should indicate energy density, while bitterness tends to indicate toxicity. The high sweetness detection threshold and low bitterness detection threshold would have predisposed our primate ancestors to seek out sweet-tasting (and energy-dense) foods and avoid bitter-tasting foods. Even amongst leaf-eating primates, there is a tendency to prefer immature leaves, which tend to be higher in protein and lower in fibre and poisons than mature leaves. The “sweet tooth” thus has an ancient evolutionary heritage, and while food processing has changed consumption patterns, human physiology remains largely unchanged. Authorities consider sugar as ’empty calories’ – but there is nothing empty about these calories. A growing body of scientific evidence is showing that fructose can trigger processes that lead to liver toxicity and a host of other chronic diseases. A little is not a problem, but a lot kills – slowly…. Is it really coincidence that industry front groups have been putting out more pro-sugar messages than usual? 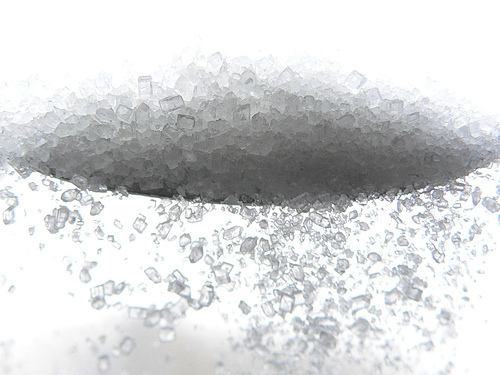 The month after publication of Lustig’s article, the International Food Information Council added a “Sugars and Health Resource Page” to pound home the point of how wholesome, safe and healthy sugar can be. Sugar intake from sugar-sweetened beverages alone, which are the largest single caloric food source in the United States, approaches 15% of the daily caloric intake in several population groups. Adolescent boys in the United States consume an average of 357 kcal of the beverages per day…. Unlike carbohydrates with high fiber content, sugar-sweetened beverages are nutrient-poor and are often associated with consumption of salty foods and fast foods. An emerging association between the increased consumption of sugar-sweetened beverages and chronic diseases such as type 2 diabetes, hypertension, and coronary heart disease is a major concern. Before the end of the day, the beverage industry was in full spin mode, tossing out unreferenced “facts” that largely sidestep the issues at hand. That “forty-eight percent of overweight and obese individuals drink no sugar-sweetened beverages” says nothing about those who do. And while it’s true that sugary drinks aren’t the sole source of increased caloric intake, they still play a role (in all their super-sized glory). More, soft drinks offer nothing nutritionally – one reason why they’ve become an easy target for regulation. With processed food, you still get some nutritional value with the junk. With soft drinks, you get nothing but colored sugar water with some preservatives (and maybe a vitamin or two thrown in if it’s an “energy” or “smart” drink). There is very little of the body building minerals in maple syrup, cane syrup from sugar, or honey. They can all defeat an otherwise efficient [healthy diet]. The problem is not so simple as merely cutting down or eliminating sugars and white flour, though this is exceedingly important. It is also necessary that adequate mineral and vitamin carrying foods be made available [to the body]. But sugar is so nice! you say. Indeed, it is – and even nicer when used less often and in smaller amounts. Here are 12 great tips from Mother Nature News to help get you started.